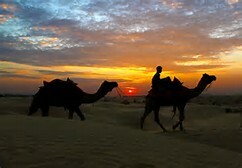 Sam Sand Dunes is a must visit in the state of Rajasthan in the environs of the city of Jaisalmer. It is likely that you are going for a Desert Safari when planning to visit Thar Desert or else, the point of going there is useless, making the Sam Sand Dunes an increasing major tourist attraction of the city. Although it is said many times that Jaisalmer is the best time of the day to go there is before sunsets at around 4-6 PM or in the wee hours of the morning at 4-6 AM, before the sun rises. Most of the visitors are in jeep loads coming from Jaisalmer who are being chased by stubborn camel owners for a ride with fees, children dancing on the street dressed up in a local outfit, and little children and even young guys who sell soft drinks to quench the thirst. The place has become very touristy over the years; many want to experience the desert during sunsets and sunrise, which is some sort of being in a carnival atmosphere than any other. Sam Sand Dunes are a simply amazing. These dunes are 42-45 Kms away from the golden city (Jaisalmer) and has a nice sealed non-bumpy road which is maintained by Indian Arm forces. These sand dunes are the very much similar to Sahara desert. The best time to visit these dunes is either sunset (around 4-7 PM) or sunrise (4-6 AM). There are many other activities which once can enjoy like these dunes have many locals who offer camel safari & jeep safari. Plus there are many desert camp owners who offer Swiss tents and mud cottages just next to Sam dunes. Here once can enjoy special Rajasthani musical and dance program & by night can have dinner prepared by these camps (both veg and non veg. 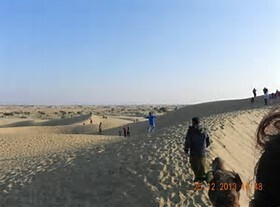 Majority of the travellers prefer to visit the Sam Sand Dunes for a day excursion coming from Jaisalmer, others joining in some camel safaris. Bonfires are always an important aspect of the trip where everyone can learn and enjoy the Rajasthani music and dance as well as dinner which is prepared by the camp operators that are either vegetarian or non vegetarian for both the local and international guests. 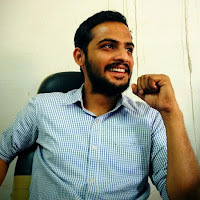 Gopal Paliwal studied at The Fabindia School in 2008-2009. Then he went to IIT Point Laser in Jodhpur. 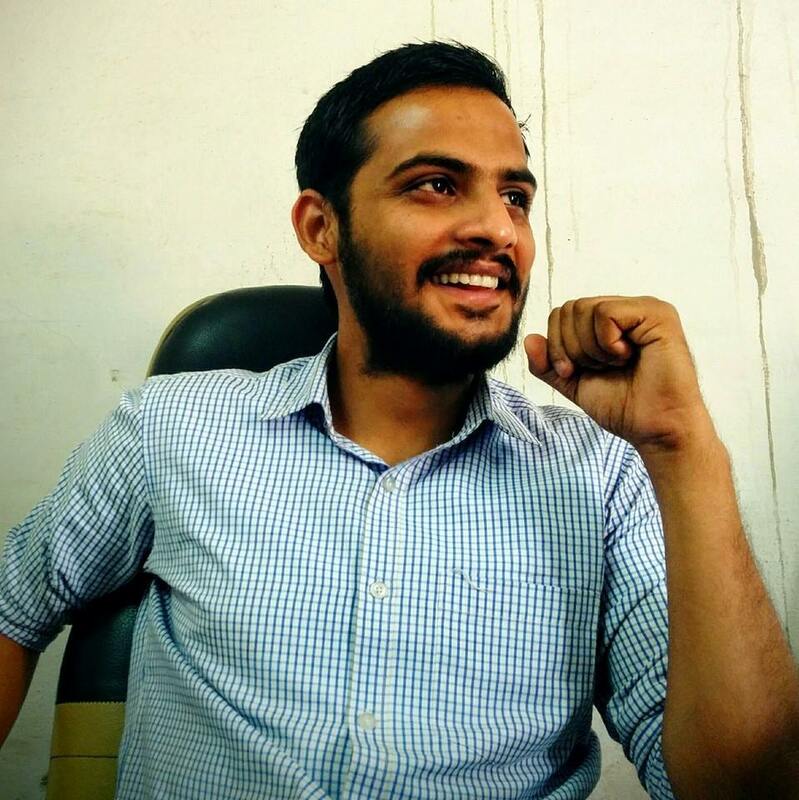 After staying and studying for two years in Jodhpur he joined the Indian Institute of Technology at Dhanbad. He completed his Engineering in Mining Machinery from Dhanbad. He is nowadays working Maintenance Engineer at BGR Mining & Infra Pvt. Ltd. Singrauli. (Ed: Editor, SVI: Sharmila Vijaywargi). ED: When did you join the school? SVI: On 1st July 2014. ED: Who was the Principal at that time? ED: What type of environment was there? SVI: The environment was very free and cool. ED: Which classes did you teach at first? ED: Are the students who have left the school in contact with you now also? ED: Who are the teachers teaching with you from when you joined to now also? SVI: All are there and some new staff has also joined. ED: What is your qualification? SVI: My qualification is M.A. Political Science, N.T.T.. I have 20 years of teaching experience. ED: What is your experience in this school? SVI: I have learnt so many things like PDP program, working on computers and many more new things. SVI; Students should work hard for their future. If they want to achieve something in their life they should concentrate more on studies. 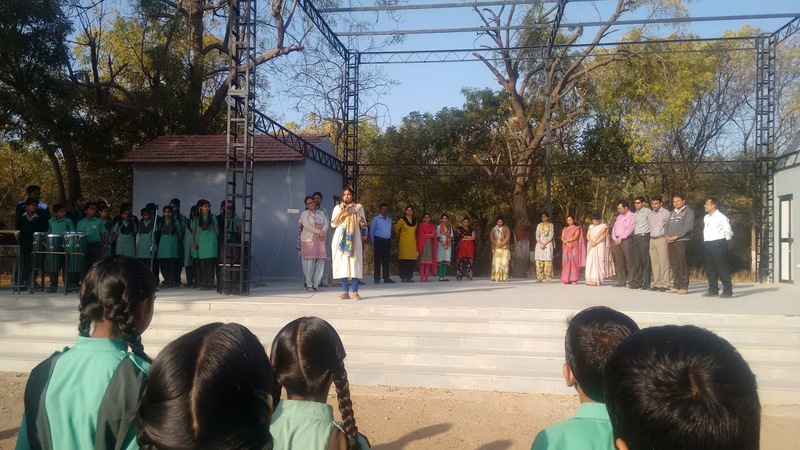 Thursday, 2nd March: Mrs. Meenu Jain M/O Darsh Jain/V was selected as the Parent this Week. She spoke at length to the students. She gave the students some tips on how could they prepare for their Final Examination. She told the students to keep themselves out of stress and to sleep well and not to study overnight. She told them to think positively and not to think that they can't learn things. They should eat healthy food and not to eat junk food because that will make them sick. The last and main thing was time management. They should fix their time for studies and for break .They shouldn’t study overnight. They should also take a break to refresh themselves. MJ: I am a housewife. ED: How many children do you have? MJ: 2 Children, 1 boy and 1 girl. ED: What did your ward achieve while studying in the school? MJ: Always good in studies and performed well in co curricular activities. ED: What do you expect from your child? MJ: To be a good student and improve his English. ED: What difficulties did you face while your child was studying? MJ: He is very happy here but due to some misunderstanding he wanted to go to another school. I am happy that he is now back in Fabindia. ED: What do you want your child to become? MJ: I want him to become software engineer. He should become a good human being. ED: What message would you like to give to our school? MJ: I want the students to work hard and to focus on their aim so that they may achieve success in their life. Tuesday, 28th February: The birthdays of the students from Nursery to Class V that fell in the month of January and February was celebrated in the Main School Campus. 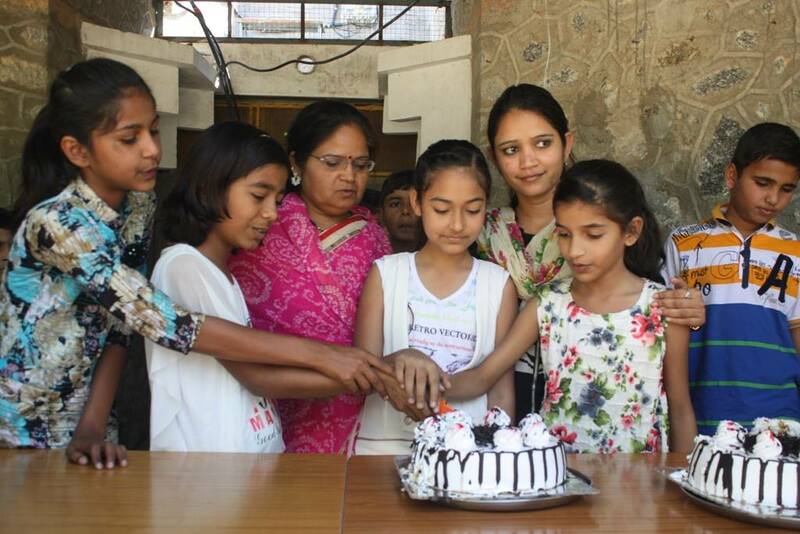 The birthday students partied by cutting the cake, dancing and distributing chocolates. They enjoyed a lot. 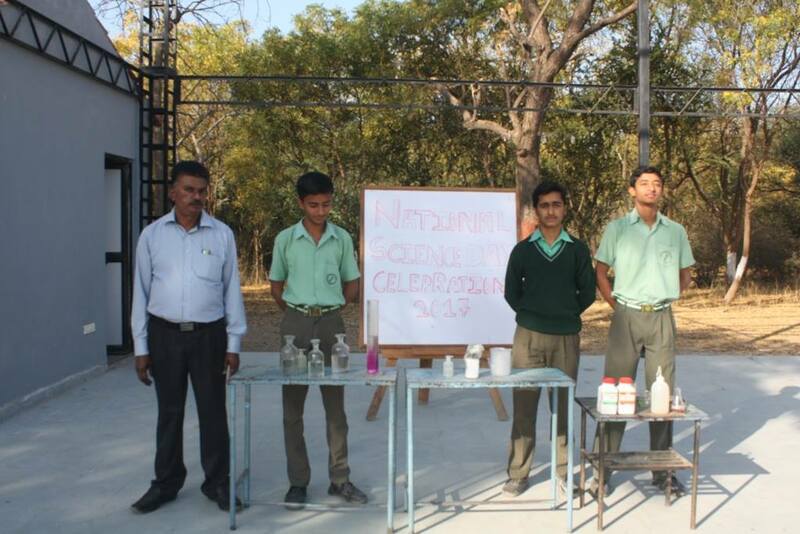 Tuesday, 28th February: On the occasion of National Science Day a Special Assembly was held. Mr. Byju Joseph/HOD Science told us the importance of National Science Day and why it is it celebrated. Kreena Rao/VIII/DH: Spoke about Why National Science was celebrated? She said that National Science Day is celebrated in India on 28th February each year to mark the discovery of the Raman effect by Indian physicist Sir Chandrashekhara Venkata Raman on 28th February 1928. For his discovery, Sri C.V. Raman was awarded the Nobel Prize in Physics in 1930. Ritu Chouhan/VIII/RH: Spoke the Facts of Chemistry. She said that Chemistry is a fascinating science, full of unusual trivia! Here are some fun and interesting chemistry facts. The only elements that are liquid at room temperature are bromine and mercury. However, you can melt gallium by holding a lump in the warmth of your hand. Unlike many substances, water expands as it freezes. An ice cube takes up about 9% more volume than the water used to make it. If you pour a handful of salt into a full glass of water, the water level will actually go down rather than overflowing the glass. There is about 1/2 lb or 250 g of salt (NaCl) in the average adult human body. A pure element can take many forms. For example, diamond and graphite both are forms of pure carbon. The chemical name for water (H2O) is dehydrogenate monoxide. Mansi Choudhary/VIII/DH: Spoke the Facts of Light. She told that light travels at a speed of about 300,000 km/s. The sunlight that we see here on Earth actually left the Sun 10 minutes before. During photosynthesis, plants use light energy to create chemical energy. Jatin Tripash/VI/GH: Spoke the Facts of Biology. He said that people that study biology are known as biologists. Australia's Great Barrier Reef is the largest living structure on Earth. The first person to see a live cell with a microscope was Antonie van Leeuwenhoek, in 1674. Ecology is the study of ecosystems and how organisms interact with their environment. Dhawan Choudhary/IV/TH: Spoke about the Green House effect. He told that the greenhouse effect is a natural process that warms the Earth’s surface. When the Sun’s energy reaches the Earth’s atmosphere, some of it is reflected back to space and the rest is absorbed and re-radiated by greenhouse gases. Greenhouse gases include water vapour, carbon dioxide, methane, nitrous oxide, ozone and some artificial chemicals such as chlorofluorocarbons (CFCs).The absorbed energy warms the atmosphere and the surface of the Earth. This process maintains the Earth’s temperature at around 33 degrees Celsius warmer than it would otherwise be, allowing life on Earth to exist. The problem we now face is that human activities – particularly burning fossil fuels (coal, oil and natural gas), agriculture and land clearing – are increasing the concentrations of greenhouse gases. The first experiment that Manmanvendra Singh showed that when Zinc metal is added into dilute H2SO4 as a result Hydrogen gas will formed. Second experiment was performed by Lalkar Singh was that when Sodium reacts with water it produces hydrogen gas with POP Sound. The next experiment was that when we add NaOH into Phenolphthelene it with change into pink colour and when we add HCL into it, it will change into colourless liquid. Another experiment shown was that if we make a Solution of shampoo and H2O2 and by adding yeast into it, micelles will be produced. All the experiments performed were just awesome.